Somethings not right with my first build (still waiting for the missing resistor in the mail from befaco for the second build). I went through the calibration procedure and according to that, everything is fine. However when I send pitch cv to v/oct it's about 20 cents sharp for every octave up, which obviously is totally unacceptable. The cv source is a BeatStep Pro, my other oscillators tracks fine with v/oct from it. I'm really clueless, what to do? This might be caused by damaged SMD resistors. Please measure their values. They are 120 Ohm 0.1% so they should be exactly same value (well, 0.12 ohm deviation). You can also measure the voltages in each pin of the rotary encoder. The changes must be also exactly the same. If this is not right, then the calibration procedure is done based on wrong octave changes so when using a CV input you have this behaviour. How does that look, taking into account that my meter might be (consistently) off? 1) What exactly does REF_ADJ_1 do? I mean that might have been a bit off as well, would that have an impact on the tracking? 2) Is there any one trimpot that controls the tracking, or is it a combination of several things? I mean, the things I calibrated in the past more or less had one pot for base tune and one for tracking, but with the even vco, it's hard to tell what is doing what from the rather convoluted calibration procedure. 3) Should I do anything about C22, right now there's just nothing soldered there? 4) When I first put the even in the case there was a solder bridge between legs of C14 (or was it C16), causing my PSU to now provide -12V (IIRC). I immediately shut the power off and by visual inspection found the solder bridge and fixed it. From then on the even seemed to work as expected until the end of the calibration procedure, when I tried sending it v/oct. Could that have damaged something? When I receive the missing resistor for the other build, it will be interesting to see how the other even behaves after calibration. i completed my second build of this module and i'm having one issue. all the wave outputs (except square) are greater in amplitude than they should be, based on the schematic and my other module. the outputs are ~8V-p instead of ~5.6V as the schematic indicates. i've checked all the component values of the saw core circuit (IC2B, IC4A, IC2A, and associated passives) and they are correct. i've also performed the calibration several times but it doesn't seem to affect the output level. any idea what might be causing this? 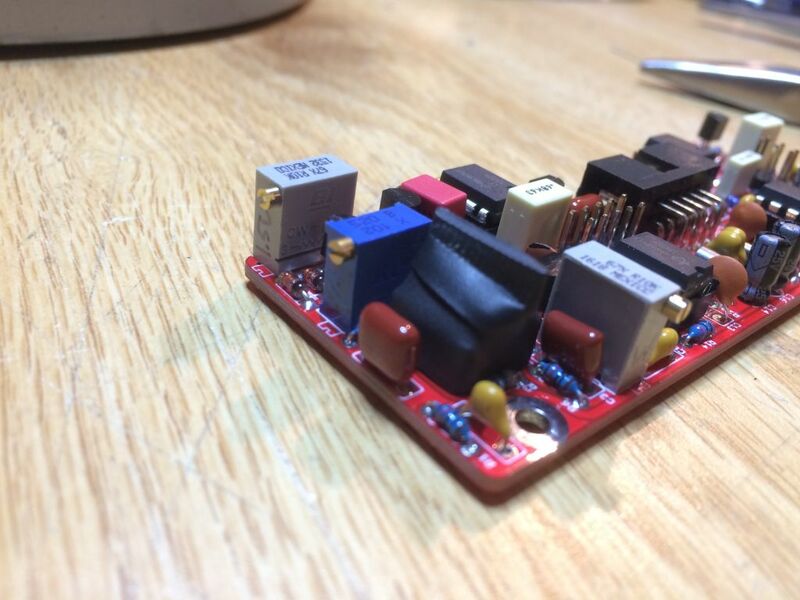 the first module i built was a V0.3.3 while this one is a V0.3, could that make a difference? according to the schematics the voltage levels for the saw core of both versions are the same. this wouldn't be a huge deal, but the increased amplitude of the saw core increases the amplitude of the triangle and thus causes the sine wave to distort. i'd also like both my befaco VCOs to behave the same. i suppose i could modify the gain of IC2A, but i'd rather identify the root of the problem. i have had luck adjusting REF_ADJ_1 to help get common tracking between the octave switch and the cv tracking of a beatstep pro but after 20 min the tracking is out again i wonder if it could be my power supply in the case fluctuating? going to have to monitor that. i noticed that all my meters were a little different when i adjusted REF_ADJ_1 to 1.504 it was perfect for about 20 min. So your even is not stabilizing? Sounds like mine, one of my evens is in Barcelona for investigation, although Befaco haven't been able to track down (or as far as understand, even reproducing) the issue yet. ya i put it in another case with different power supply (tip top zues, instead of dopfer diy. ), re calibrated after warm up that takes about a half hour in the case. i can see the tuning rise with the temperature over a half hour till its stable, but then it starts to fall as it cools, when i take it out to calibrate. it seems super sensitive to heat, i thought it was supposed to be super stable but i have had no luck, :( each day i go back to it it is way off! 30 cents over 3 octaves today after it was perfect for hours yesterday? Thanks a lot for this feedback! The more data we have the better to perform some testings over here. We are testing with Atte's VCO and a couple of other VCOs here in the lab. We are definetly facing an issue here and still did not found a satisfactory answer. Is there any more hidden component ? R115 shown in the schematic as 1k 1% but in manual as 50 0.1% , I'm not sure about this . I have had trouble getting the v/oct to track. I have the octave select working, but then the v/oct trimmer does nothing. I read earlier in the thread replacing this with a higher value 100K trimmer might work. I have spent so long trying to get this to track properly. I have already tried replacing the SMT resistors. s z3000 to get it to track! Damn. I was thinking about building one of these next - so what's the status on this? Is there a general tracking issue with this VCO? I had the same tracking issue - calibrate for the octave selector, but then v/oct is sharp ~20c per octave. I think I've figured it out. The v/oct summing resistors are 100k, and the octave selector is .5v/oct, so its summing resistor should be 50k. The v/oct inputs have 100k 0.1% resistors but the selector has a 50k 0.1% in series with a normal 1k 1% (R115). I just jumped R115 and recalibrated and now I'm getting much better tracking, about +/- 15c across 10 octaves. Sorry for the lack of communication over here..... seems we are not passing by muffs as often as we should!! We have been investigating all mentioned issues with Even VCO since a few months and driving us nuts... so here some updates. About tracking issues, we have a workaround in place and will implement definitive fixes on next version. This is the workaround in place and what has been changed in current VCO documentation! Question: are by any chance these 15 cents deviation located in the last three octaves? in our tests there is one cent in octave 7 and 2 - 8 extras on 8th and 9th. Yep the biggest deviations are in the lowest and highest octaves. I recalibrated after waiting for the module to warm up in my case and was able to get even better tracking than before. Yes, float32, thank you for the analysis and the suggested fix! I just finished building an Even VCO the other day. After verifying that the updated documentation from Befaco now officially says to jumper R115, I went back to mine and did that modification. After many tuning attempts, however, I am still getting poor results on pitch tracking across octaves. Befaco, could you explain which parts of the perfomance are going to be the most affected by temperature? Is the "width" trimpot's effect going to vary with temp? Or just the baseline "init", i.e. absolute tuning, parameter? Also, has anyone gone in and modified their Even VCO by adding thermal paste to the key temperature-sensitive components? After poking around a bit more on the schematic, I pulled up the PCB files to see where QQ_1 and T_SENS are positioned. So they're the pair of SMD parts that were under IC2. Should they get some heat sink compound piled on top of them? Granted, I'm new to using tempco parts – but as-is, I don't see how the two parts would be in thermal contact, just sitting side by side on the board. And was the idea of placing them under IC2 just to save space? Or is it important for QQ_1 and the tempco to be thermally bonded with IC2? EDIT: Or maybe the idea of being under IC2 is to put the matched transistor pair and the tempco in a little cave together, to reduce (cooling) air flow across them? And if so, would sealing the edges of the "cave" (with compound or heat shrink or something around the IC socket) further reduce frequency drift? I just jumpered R115, changed one of the SMD resistors near the octave selector, and now there's no sound coming out of my module from any of the waveform outputs. It had been working for a year. Something else must have gone wrong. Even without any voltage coming from the octave selector section, there would still be other sources of CV, and sound would still come out. Did anything get switched around with the power connectors, after you took the module out to solder it? Nope, it has a keyed header so it'd not really possible to plug in backwards. I checked a couple points with the multimeter and both panels were receiving power - turned the front pots and saw the voltage change accordingly. Really all I did was remove and jumper R115 and replace R117 with a more accurate SMD resistor. Checked those with a multimeter as well and there was continuity. So what could make the sound disappear from all five jacks while it's all apparently still powered? Have you contacted Befaco? They are actually pretty awesome.